When visiting downtown Flagstaff, you’ve probably noticed an old black Baldwin locomotive steam engine sitting along the railroad tracks on Route 66, but do you know where it came from and why it’s there? 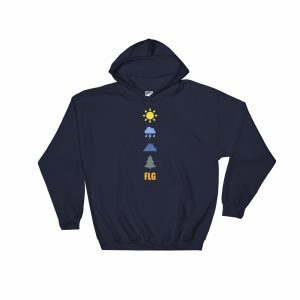 If you’re curious about the history of the iconic Flagstaff relic fondly known as Old Two Spot, then we’ve got you covered! 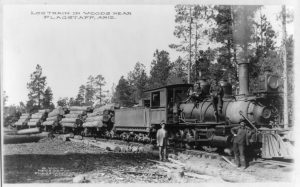 The story of how Old Two Spot received its name is quite interesting, but first let’s look at the lumber industry, its ties to the early Flagstaff community, and the history of the engine. Back in the 1880’s, a huge amount of lumber was needed to construct the railroad and when progress got delayed at Canyon Diablo east of town a Chicago businessman named EA Ayers saw a major opportunity. 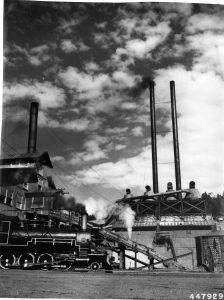 He hauled a steam powered lumber mill to Flagstaff from Chicago and started operations in August of 1882. After a short time, Ayers sought out and hired Matthew Riordan to manage the mill and by 1887 it had been purchased by the famed Flagstaff family. It was called the Arizona Lumber and Timber Co. and its huge operation had rails running from the mill into the forest like spiderwebs. Perhaps on a hike you’ve seen remnants of this network in the form of old railroad ties or spikes littered around the forest. The mill was owned by the Riordans until the great depression and afterwards, from the 1930’s to the 1990’s, the operation and Old Two Spot changed hands eight times. The Old Two Spot engine is a Baldwin 2-8-0 locomotive and was built in 1911 in Pennsylvania. The 2-8-0 refers to its wheel arrangement of two wheels on its front axle, eight driving wheels with four on each side, and no trailing wheels. The locomotive was designed for industrial purposes, and specifically to haul heavy loads at low speeds. Which was perfect for transporting huge amounts of timber from the forests to the mill for processing. 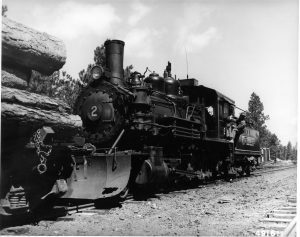 The engine was purchased by the Riordan-run Arizona Lumber and Timber Co in 1917 and was passed down from owner to owner even after it was retired in 1966. The last lumber company to operate in Flagstaff was called the Stone Forest Company, closing its doors in 1993. Residents and enthusiasts led by Flagstaff local Malcolm Mackey put forth a major effort to purchase the train, restore it, and put it on display at its current location. The City of Flagstaff purchased the train in 1995 from the residents and dedicated it as a monument in 1999. Mackey was also instrumental in saving the Baldwin #12 that is on display in front of the Flagstaff Pioneer Museum. Old timers like Mackey said they could remember when the engine would drive through town because the sound of its whistle was so unique, and they fondly named it Old Two Spot because of warn numbers on its sides. Its official name is engine No. 25, and legend has it that the engineers had water bags that would hang out the engines windows. Over time the fives were worn away by the bags leaving just the twos and the spots, hence the name Two Spot or Old Two Spot. Thanks to the efforts of Mackey and the City of Flagstaff the train now sits as a monument to the impact of the lumber industry in Flagstaff and most importantly as a remembrance to the lumber workers that helped to build our town. So, go check it out!